I'm not much of a cake person. I would pick pie or a creamy custard over cake any day. And because I don't really get excited about cake, I've never put any energy into learning how to make a decent one. However, in the course of things, I have made a few cakes from scratch, mostly as a vehicle for some fruit or another. But my dear son requested a homemade cake for his birthday. A birthday cake, a real, live, layer cake with frosting in between and specifically NO FRUIT of any kind involved. He wanted yellow cake with chocolate frosting. As I mentioned, I have made cakes from scratch before. So I was more worried about the buttercream than the cake. I decided to give the recipe a test run by making cupcakes for my son's actual b-day. I decided to make Amy Sedaris' vanilla cupcake recipe from this incredible website. 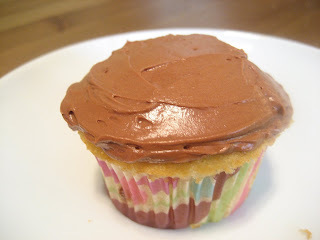 And to make the chocolate eggwhite buttercream (recipe in link above) to frost them. I had a great time making this buttercream. I was venturing into unknown territory and it was exciting. I carefully chopped and melted my chocolate. I whipped my eggwhites and prayed that what I thought was stiff peaks is what RLB thought was stiff peaks. And then I, ever so patiently, added a pound of butter, by the tablespoon, to the eggwhites . . . . . . . . . . . . . . . . Whew! that took a long time. All the while, I didn't believe that those eggwhites could possibly absorb all that butter. At one point the mixture looked curdled. But the wise, all-knowing RLB talked me down from the ledge with her instruction on how to smooth it out. After all the butter was added, I got to mix in the melted chocolate and I was rewarded with an ethereal-ly light, but incredibly chocolatey buttercream. It was so smooth, creamy and velvety in my mouth, I couldn't believe it. And it was very easy to work with. To make a long story short, since I had success with the cupcakes, I felt confident making the cake for the actual party day. The second time through, the buttercream recipe came out just as well. The cake itself was good too, but hardly noticeable because the buttercream was so delicious. Sure I could use some lessons on how to properly frost a cake (I know I should have saved some white icing and used a different tip to do the lettering,) but to 11-yr old boys (and one sweet one in particular; it was just fine. It's beautiful! 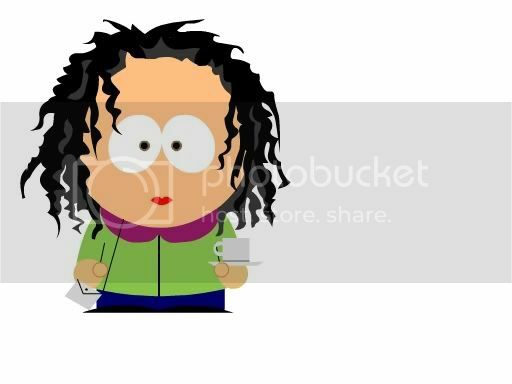 You are so smart and brave... you're my hero! Amy, now you're making me blush. That's very nice of you to say, but you're baking skills make you more my hero. BTW, I'm doing the cod with breadcrumbs and aioli tonight. I already made the aioli, YUM, I could eat it with a spoon. Wow, that looks yummy! You're my hero too! 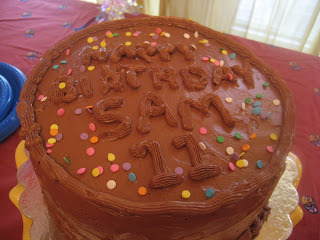 I bet Sam was thrilled, that was my favorite yellow cake with chocolate frosting - it's a classic and all kids love it. Thank you, nice people. Betty Crocker? I think not. I certainly have a way to go. But I am itching for an excuse to make another cake. Not for my family though, bathing suit season is fast approaching!